We thank Glad Tidings for sharing this article written by our council member, Cathy Reid, for their Thanksgiving issue (September/October 2018, Volume 92, No. 5). Cathy Reid is the Women’s Missionary Society of the Presbyterian Church of Canada’s Representative to WICC. She attended the 100th Anniversary Celebration on June 23, 2018 at Yorkminster Park Baptist Church in Toronto. Ninety-five people gathered at Yorkminster Park Baptist Church in Toronto to celebrate WICC’s 100th Anniversary. The planning team worked for more than a year on the celebration. 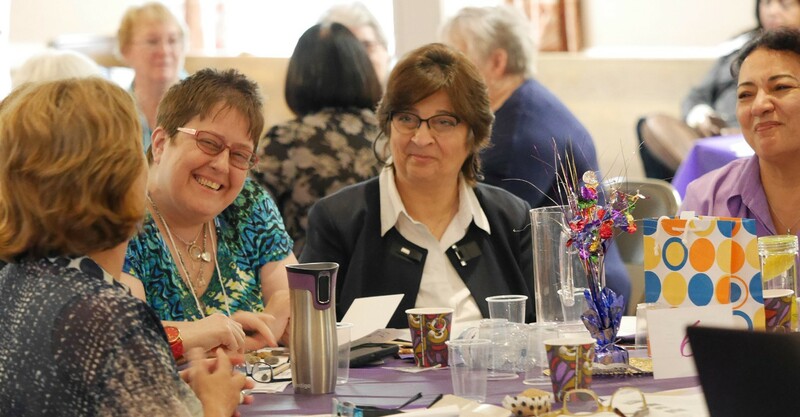 In order to reflect WICC’s current Mission Statement—Empowering Christians to pursue justice, peace and reconciliation by standing together in prayer and action—the theme of the day was The Joy of Justice, which was based on Luke 4:18-19. Ninety-five people, including alumnae, current members, and friends gathered to share this special day. One could feel the joy of friendships renewed and fellowship shared in the hall. From the opening prayer to the closing hymn everything flowed beautifully. Greetings were read from The Canadian Council of Churches as well as from denominations represented on Council. The letter from Janet Brewer, WMS Council President, was much appreciated. The worship leader, Catherine Bartlett, inspired us with her music and taught us the hymn, “In a World Full of Sorrow.” This was specially commissioned from Judith Snowdon to reflect WICC’s mission statement. Anointed Joy, the liturgical dance group from St Andrew’s Presbyterian Church in Whitby Ontario. 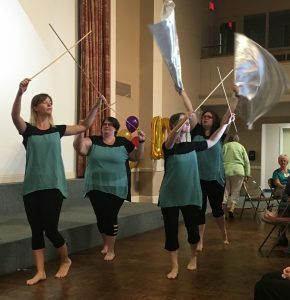 “Anointed Joy”, the liturgical dance group from St Andrew’s Presbyterian Church in Whitby Ontario, presented dance based on our theme and on the chorus of our commissioned hymn. Everyone was given the opportunity to join in the dance choreographed for the chorus of the hymn. To hear this hymn yourself, visit the WICC website page: https://wicc.org/all- together-now/. Eliane Massaad of Beloved Women (formed in 2010 and based in Milton, ON) spoke about their project entitled, Developing Vocational Training for Women and Syrian Refugees. Their mission is to care for, empower, and support women. Karen Ward of Cadence Leadership Resource (CLR) spoke about the Burning Stone Program. This is a CLR program which works to connect Indigenous Women and Youth from Northern Ontario remote communities. The project title isGikendan (to know it or realize it) and will be based in Thunder Bay. The program is to train the trainer for the NLL Indigenous Leader Track. Finally, Peter Haresnape of the Student Christian Movement spoke about the Student Cahoots Festival which is held each year. This year’s camp was held at Cedar Ride Camp, McArthur Mills Ontario, with the theme “Leaning into Discomfort.” The weekend featured guest speakers, workshops, facilitated conversation, and of course a dance party. A surprise awaited the grant recipients at the end of their interviews. Catherine presented them with their grant cheques. Normally the cheques are sent to the grant recipients. It was a joy to meet and share in their delight. One of the other grant recipients was Arise Ministry of the Presbyterian Church in Canada. A special cake was shared after lunch and we sang Happy Anniversary to celebrate the occasion. Alumnae members were presented with certificates as a memento of the day. Rosangela Oliveira of the World Day of Prayer International Organization spoke about the services taking place throughout the world. She reminded us that “World Day of Prayer is a global ecumenical movement led by Christian women who welcome you to join in prayer and action for peace and justice on the first day of March.” This year’s service was from the women of Suriname and the 2019 service will be prepared by the women of Slovenia. The keynote speaker for our celebration was Emily Pelly, a PhD student in Halifax NS. Her thesis for her PhD is on Trafficking. Since she was unable to travel to be with us as she in the midst of a high-risk pregnancy, she joined us through the magic of computer technology. She shared her knowledge and expertise with us and her words were informative, challenging, and gave us much to think about. June 23 was a wonderful day of celebration shared with WICC members, alumnae, and friends. Looking forward to the next 100 years! I had the pleasure of attending the 100th Anniversary celebration. It was a wonderful opportunity to visit with former WICC Council members and the WICC Staff. My thanks to former WICC Council member and friend Lynn Smart for housing both Norma Wrightly and myself. That was just an added perk. We got to see “Come from Away” while we were in Toronto and “from away”!